Wow. 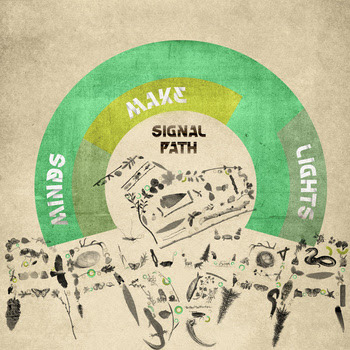 Marking the first day of summer, Signal Path drops part two of their "quadrILLolgy" entitled Minds Make Lights. Earlier this year they released part one, The Prosaic Fades, on the Spring Equinox. I think we can all predict when to expect part three. Signal Path is bringing us their classy take on electronica and more importantly a fresh take on the filthy bass sounds of dubstep. Although dubstep has started to gain a rep for filth and grime, the wompy bass of this four track EP is more controlled and focused and never becomes overbearing. The beats are tight and danceable and the instrumentation is what keeps Signal Path grounded in a realm of electronic music that has longevity. You may find Minds Make Lights a bit too short, but it will only leaving you wanting to listen again. With the complex arrangements and deep textures of these tunes, you won't find it hard to listen to this over quite a few times.